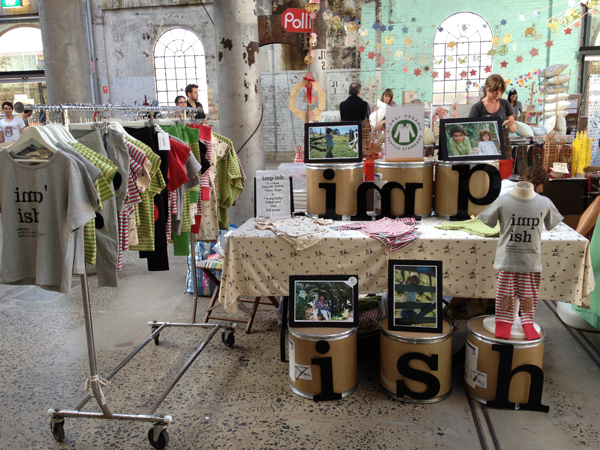 Tell us about your kids fashion label, imp`ish. Is like it’s meaning… inclined to do slightly naughty things for fun. My feeling around it stems from how I playfully see kids miss matching patterns and colours, my own children, don’t coordinate naturally they wear clothes because they’re comfortable colourful and slightly fruity & silly. 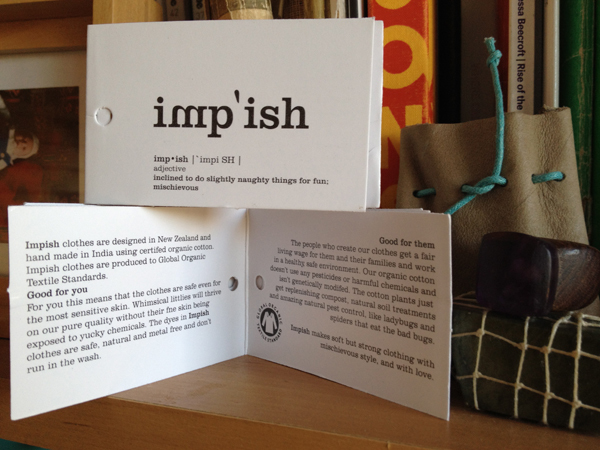 Imp`ish has been all about non gender basic’s in colour and style but with a spin. 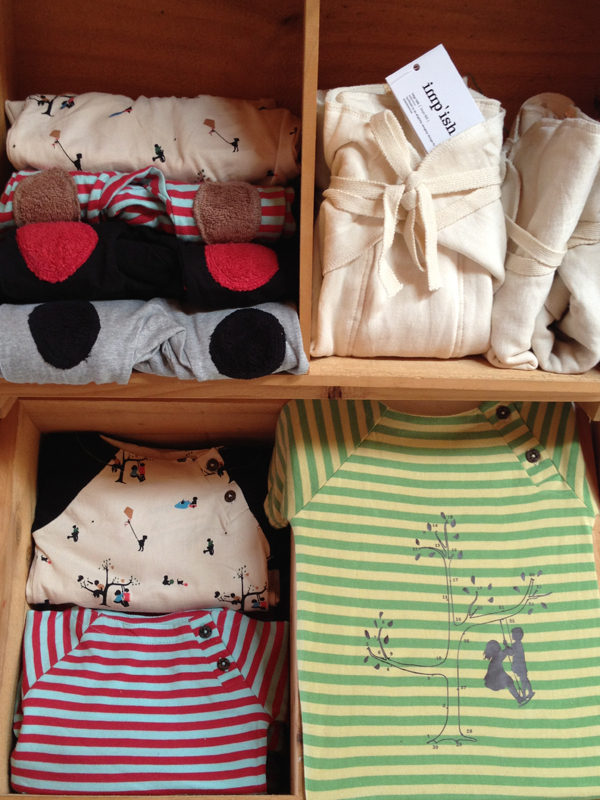 Fabrics are hand screen printed and knitted for imp`ish and the pieces are for boys and girls from 0-5 years. Although I have 5 daughters and know what they like, so I’m designing a collection of girls skirts & dresses S/S13 as imp`ish at the moment seems to be more attractive for boys. All certified organic cotton healthiest for children, farmers, manufacturers of course the land, it’s our future… this little story is on our label. You have 6 children! What inspired you to start your own kid’s label? 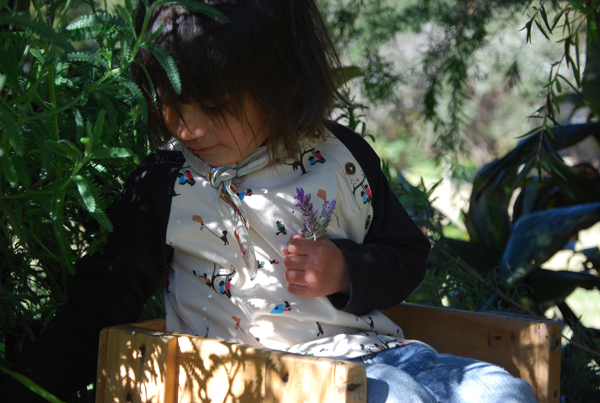 After Maia was born (my 5th baby and 2nd child to suffer with eczema) I looked into organic cotton clothes. There wasn’t much choice in New Zealand 6 years ago so I looked into a few ranges and started importing from USA & Germany, selling at local markets & my web site. 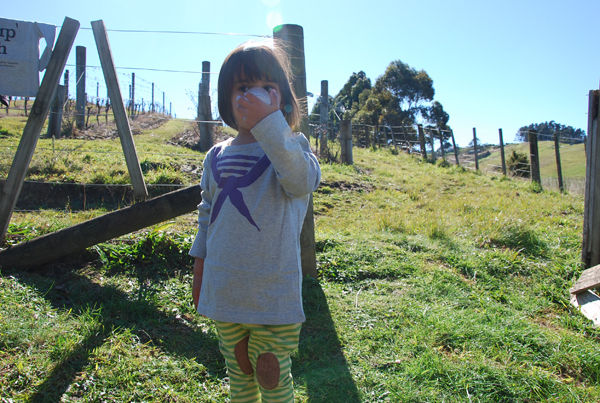 I opened retail store Organic Island Baby 4 years ago in Devonport Auckland. Having had a web site for 2 years prior to our brick and mortar store was one experience, but being face to face with our customers taught me what shoppers really wanted and why they came back. So I went back to my roots, I studied Fashion Design fresh from high school. 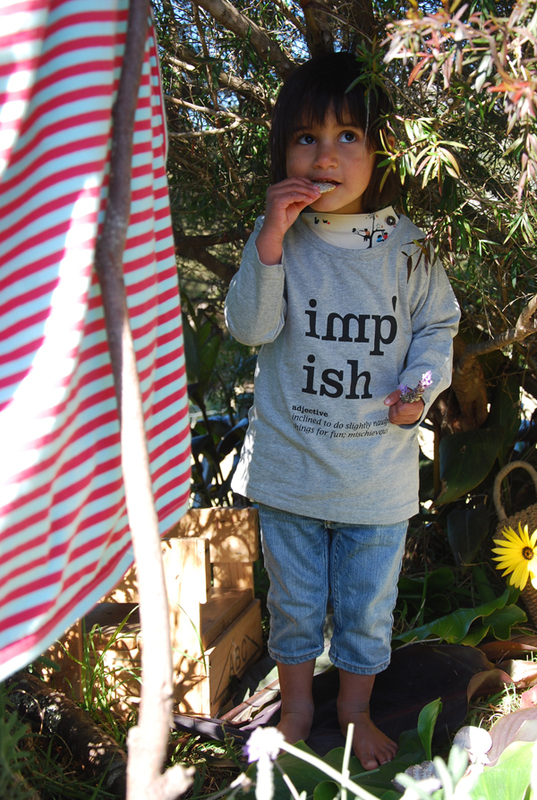 Designed my 1st collection, imp`ish was born, I shut the shop and launched at Kids InStyle Sydney 2010 to focus on wholesale and being more available at home with my family. 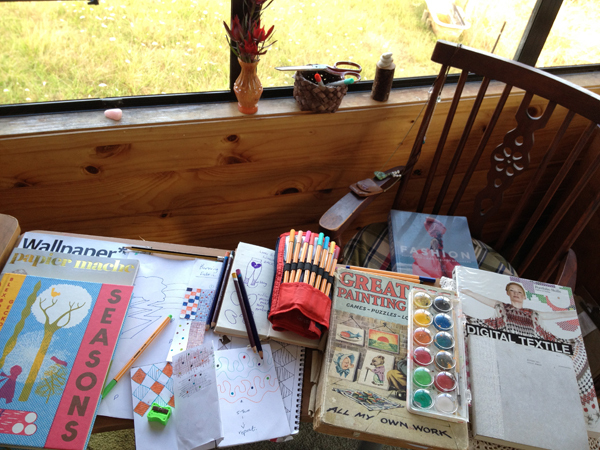 What do you love about designing for children? I love the freedom and no pretentiousness of kid’s clothes and the joy it brings to peoples faces when they see the sizes and imagine babies wearing them or that have yet to be born. I love the idea of creating a product that is an investment in not just in one or more children’s clothing but as valuable ideal to help more than one, a lot of people and families in the process are helped in India. What was some of the challenges you faced and how did you get round them? 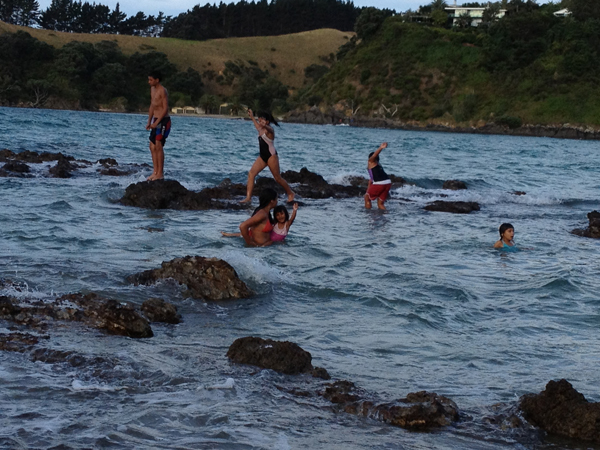 I live with my 6 children, 1 bantam rooster and 2 hens on beautiful Waiheke Island about 35 minutes by ferry from Auckland. I’m a single mother so raising my flock is a juggle they range from 3 to 14 (hooray for my legal baby sitter son Sam). They help in the home but that takes up loads of time and energy. I make sure if need to get work deadlines done (like this one) that I try and plan and focus time not always in the home office. Multi tasking doesn’t get work done when kids are at school and kindy, so my creative lab with my collective group of graphic design friends gives me support amongst cups of tea and laughter. (Don’t be afraid to ask for help). The clothes are made in India, it’s frustrating its not around the corner, yet so rewarding I try and go once a year to work on the styles and specs and delicious fabrics, and I’m in the process of changing supplier for better quality. Having fabric’s hand screen-printed leaves a lot of room for texture and mistakes but that’s part of the endearing quality and what I love about that media. Online Pinterest, Kuler, Instagram, I’m into Japanese and European fashion sites & blogs… movies, art galleries, music, growing my food, nature around me, and of course my kids are my biggest inspiration (oh my creative lab girl friends too). Go for it, nothing gained if you don’t try! Experience and growth is our journey and lessons in life; especially for me as a mother I wanted to work from home, and teach my kids by example to live your life with out fear. To be the creative you, what ever that will be, give back positively and make a difference for a better world – sounds mushy but true.